Welcomed by a few dogs and cats is a great first start! Rooms are nice and clean, for personal stuff there are lockers! Location is great! Staff is very nice! Definitely was worth our money! Easy come, hard to go, loved this place! The stay in Easy Go was Amazing! 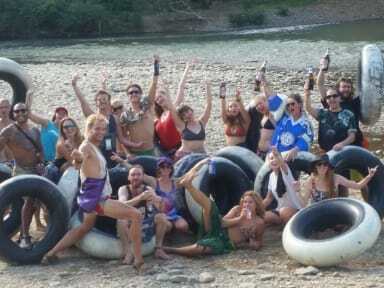 It’s a really good place to meet people, hang out and just chill.. We went tubing with Dodo! The owners are really! You can book bus tickets from there. The rooms are a sauna in the day time but then you have to be hanging out in the common room and be social, play pool or enjoying the mountian view. Had an amazing time here. Let’s be honest; it’s not the cleanest hostel, and they don’t have amazing facilities (only 1 hot shower, 1 working toilet, bad wifi, no ac), but it’s a hostel where you’ll feel right at home. Amazing staff, fun things to do and just a good vibe all the time. Plus, the animals are a big plus too. Wij zaten in het nieuwe gebouw, dit was erg schoon en netjes. Het ontbijt was niet inclusief maar wel erg lekker. Onze kamer had een airco maar hier moesten we extra voor betalen, wat de prijs van 8 naar 12 euro per nacht verhoogde. We hadden via dit hostel ons vervoer naar Luang Prabang geregeld, een minivan. Deze was 1 uur te laat, overboekt, onvriendelijk, suïcide driver. En toen iemand opmerking maakte toen we aan rand van stad gedropt waren, zijn we de bus uitgejaagd met een mes! What you pay is what you get. Nothing special, but doable for one night. Quite far from the bars in comparison to the other hostels. We stayed at the second building with no lock on the door. Weren't many other backpackers. Didn't like the hippie staff. Seemed like they could only party and didn't seem able to organise stuff for you. Very unproffesional. Breakfast took them 50(!) minutes, because cook needed to wake up still (at 9 am!) and they forgot our order 4(!) times! Bathroom was not super clean. If you still plan on staying here, ask for a bed in the new part! Nice location & beds are very comfy. No fly/mosquitoscreen on the windows. Bathroom very smelly. 4-bed dorm has only two plug sockets. There are no lockers in the room, there are very tiny lockers behind the frontdesk. There's no security in the evening/night so everyone could just walk into your room. Rooms can't be locked. Female roommate decided to bring a fuckbuddy at 4.00 AM and the next morning another 'friend' of her just got into our room and jumped on the bed. Definitely a partyhostel.